Tickets for the first-ever UFC Fan Expo have officially gone on sale and the Ultimate VIP Package has already sold out. The expo will be held during the weekend of UFC 100 and will allow fans to get close-up and personal with some of their favorite fighters. Scheduled to appear and sign autographs will be Wanderlei Silva, Rashad Evans, Rampage Jackson, Kenny Florian, Forrest Griffin and many more. You’ll also get a chance to meet the official Octagon Girls as well as representatives from many of the different MMA clothing lines. 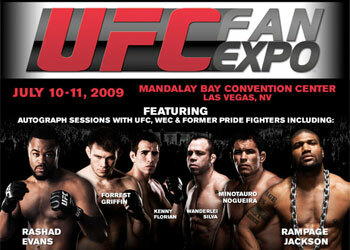 The UFC Fan Expo will take place on July 10th and 11th at the Mandalay Bay Convention Center. You can find out more information about the expo by clicking here.